Rice, 20, has won three senior Republic of Ireland caps, all in friendlies, having played for his grandparents' country since under-16 level. "This has been an extremely difficult decision," he said. In a long statement on Twitter, he said: "I consider myself to be of mixed nationality. I have equal respect for both England and Ireland and therefore the national team I choose to represent is not a clear-cut, simple selection. Kevin Kilbane, who was born in Preston but won 110 Republic of Ireland caps, tweeted: "If you're a 'proud Englishman' then why play for us in the first place?" 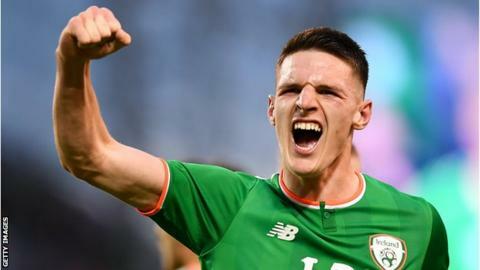 England legend Gary Lineker tweeted: "He's one of our own....He's one of our own...Declan Rice....he's one of our own." In 2004, Fifa changed its rules so players could represent one country at youth level and then another at senior level - so long as they changed by the age of 21. In 2009 it was amended so players of any age could make a switch. Senior friendlies do not tie a player down to a country.